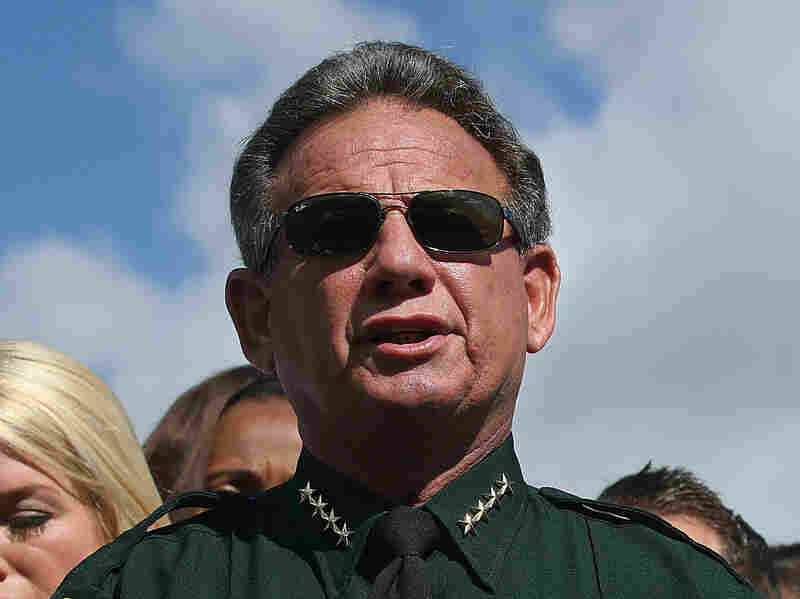 Florida School Cop Took No Action During Last Week's Fatal Shooting : The Two-Way Broward Sheriff Scott Israel says he is "devastated" by video footage of his armed deputy standing outside the school doing "nothing" during the shootings of students and faculty members. Broward, Fla., Sheriff Scott Israel speaks to reporters after the shootings at Marjory Stoneman Douglas High School where 17 people were killed on February 15, 2018. The school resource officer, a uniformed and armed deputy, was on the scene but didn't enter Marjory Stoneman Douglas High School last week when a gunman started firing at students and faculty members, Broward Sheriff Scott Israel said Thursday. Israel said the deputy stayed outside of the building in a defensive position during last week's attack. The sheriff said that Deputy Scot Peterson, 54, resigned shortly after he was suspended. Israel said he suspended Peterson without pay after watching a video of the officer standing outside the school during the shootings, which killed 17 students and teachers. "What I saw was a deputy arrive at the west side of building 12, take up a position and he never went in," a clearly frustrated Israel said in a news conference Thursday. When asked what Peterson should have done, Israel replied emphatically: "Went in. Addressed the killer. Killed the killer." Asked for his reaction Israel said, "Devastated. Sick to my stomach. There are no words. These families lost their children. We lost coaches. I've been to the funerals. I've been to the homes where they're sitting shiva. I've been to the vigils. It's just, there are no words." The sheriff said that Peterson stayed outside "upwards of four minutes." The shooting lasted six minutes, he added. Israel also said he has placed two other deputies on restrictive duty as his department investigates whether they followed policy in responding to calls about the shooter dating back to 2008.